Things to consider before you hit "install"
If you decide to install Office 365 desktop client early, there is no going back. For the most part, the functionality is unchanged; a few things will look a little different. Your adjustment period may be short. However, if this is a busy time, and you’d rather not deal with occasional surprises, you may want to wait until ITS pushes the software to campus computers early this summer. 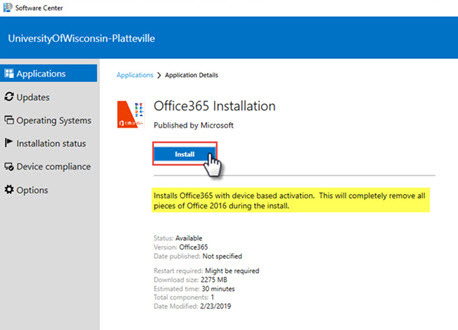 The process of installing Office 365 desktop client will remove all current Office applications from your machine, including Project, Visio, and OneNote and the desktop apps for OneDrive, Teams, and Skype for Business. Project, Visio, and OneNote will need to be reinstalled separately. Project 2019 and Visio 2019 will be available for download from Software Center, if you choose. OneNote for Windows 10 is already available on most campus systems; if you do not have it, you can download OneNote for Windows 10 from the Microsoft store. The process of installing Office 365 will remove Office apps from your desktop task bar. If you have pinned Office applications (Outlook, Word, etc.) and files to the task bar, you will need to re-pin them after the install completes. You may want to take note of items pinned to your task bar before you hit install! The process may take as long as 30 minutes to complete, so plan accordingly. Click the Windows icon in the lower left corner of your desktop and search "Software Center". 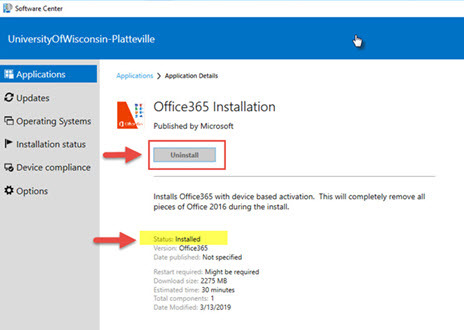 Select Office 365 Installation. The Applications tab will open. Click Install. The process may take as long as 30 minutes to complete. When the installation process is completed, the Install button will change to Uninstall and the status below will display "Installed". Repeat steps 1-4 above for Project 2019 or Visio 2019.